La sabrosita 590 am en Vivo . Also Known as XEPH AM is a radio station in Mexico City. 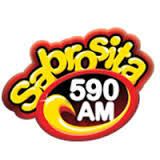 Broadcasting on 590 AM, it is owned by NRM Comunicaciones and broadcasts a tropical music format under the brand name Sabrosita. Address : Prolongación Paseo de la Reforma 115 , Col. Paseo de las Lomas , Santa Fe , México D.F. 01330 .